I was going through my old code and I stumbled upon some strange behaviour. or even list its content. Unless ofcource I am a root user. Here is a screenshot. Could you please explain ? Directories must have executable bit set to be "searchable". That includes listing contents as well as entering them with cd. Try chmod +x on the Scripts dir, for example. This is different from regular files where executable bit allows them to be executed (of course). More information here: Execute vs Read bit. 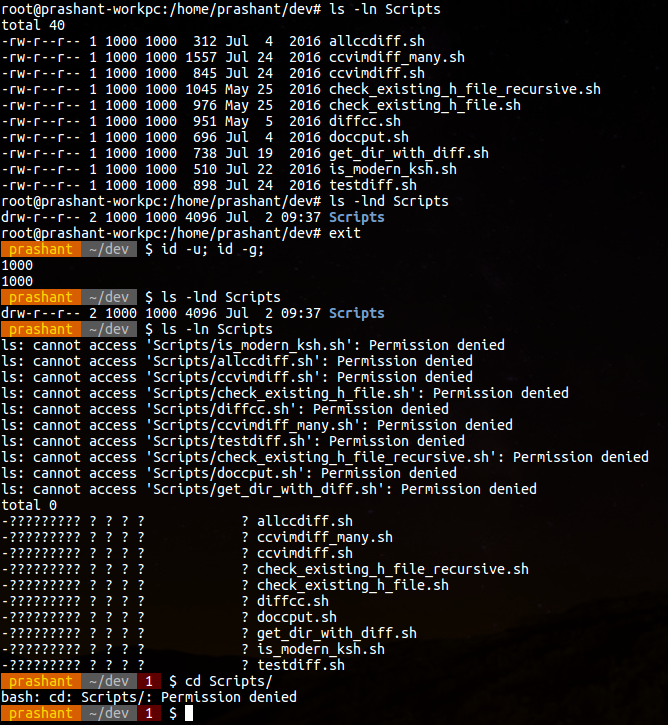 How do directory permissions in Linux work? and In Linux, "Write" Permission Is Equivalent To "Execute" For Directories? Not the answer you're looking for? Browse other questions tagged ubuntu permissions ls or ask your own question. How to set setgid bit for a program to allow it change its group folder?